We are a certified and licensed dental laser provider in Fort Lauderdale and Plantation. We specialize in dental laser procedures. Our watelase can help perform dental procedures like root canals, cavity, periodontal (gums) disease, extractions, implants and oral surgery in many clinical cases. We specialize in anxiety-free laser dental visits. We have pioneered several laser techniques under sedation in dentistry. In addition, our office is certified in twilight sedation and general anesthesia. Max Arocha DMD is a prolific innovator and awarded of U.S. and international patents in the field of injectable methods of anesthesia. Recently we have seen a new era of periodontal dentistry with newest laser technology available today for periodontal patient care. We have seen periodontal laser procedures and techniques designed specifically to treat periodontal disease like Laser Assisted New Attachment Procedure – LANAP® and Deep Pocket Therapy with New attachment® – DPT. Just like LASIK® surgery for the eyes, these FDA approved lasers therapy are a breakthrough in treating periodontal disease. Gums lasers allow laser dentists to treat periodontitis using minimally invasive procedure eliminating cutting and suture dental surgery. Instead of cutting away healthy gums tissue by using a scalpel laser dentists are now able to regenerate gums tissue attachment and new bone most of the time. 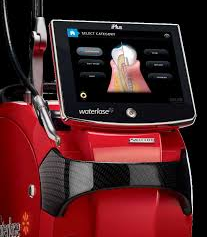 The new era of laser dentistry is here with Waterlase dental technology. We are a Waterlase iplus provider offering dental laser procedures that may transform your dental experience. The Waterlase, in certain instances, helps patients with their worry about the shot and dental drill. It comes to no surprise that people, in general, are looking for an alternative to the traditional needle and drill dentistry. Unfortunately, most people don’t know that Waterlase Dentistry exists. Dental anxiety, whether mild or severe, is real and for many people can be a barrier to seeking dental treatment. Drills and needles can prevent people from taking a positive, proactive approach to healthy teeth and gums. According to the American Dental Association or ADA, there are currently more than twenty dental indications for the use of dental lasers. The Waterlase laser system uses a unique combination of laser energy and water to provide treatment that conserves healthy tooth structure, and help minimizes pain and discomfort in certain cases. Unlike needle and drill dentistry, the Waterlase laser may perform many traditional dental procedures with fewer shots, less anesthesia, and in certain qualified cases, without pain. Approved by the U.S. Food & Drug Administration for use in many kinds of dental work – from fixing cavities to help to perform root canals, and even dental implants – the Waterlase laser is being used by dentists worldwide. In addition, in those cases by reducing the need for anesthetic, procedures that once took several dental appointments to complete, such as multiple fillings, may now be finished in just one too few visits. And, because a Waterlase allows you to handle a wider variety of procedures, there is less need to refer patients out for treatment in certain instances, eliminating another source of stress for patients. Waterlase dentists help patients to conquer their stress and worry. If you’ve been thinking twice about the dental drill, or just want a laser dental solution that may differ, you can now or book online an appointment with certified laser dentist Max Arocha DMD. He is a dentist in Plantation, FL who fights cavity and gum infection in the Fort Lauderdale area with dental lasers. Studies have shown that Laser Dentistry may be less traumatic than the dental drill in clinical certain cases. The combination of laser and water provides cutting action that is conservative, so it preserves healthy tooth or gums around a cavity or diseased gums. It’s an approach often called minimally invasive dentistry. The idea is to fix the diseased part of your tooth or gums without damaging adjacent healthy tissue. Laser Dentistry gives dentists a big advantage in providing excellent clinical care with maximum patient comfort. The Waterlase laser is made by Biolase. Biolase specializes in lasers for medicine and dentistry for improving pain reduction and clinical results. Biolase leads the global dental laser market today with the Waterlase MD and Waterlase iplus. The dental drill works with friction, which causes heat and triggers pain. This necessitates injection with anesthetic and opens the possibility for thermal damage. Waterlase Dentistry works without heat, vibration or pressure, and can replace the drill for many dental procedures. Laser technology with the Waterlase uses a gentle combination of laser energy and water that works without touching your teeth. Many dental procedures may be performed painlessly with no anesthetic in certain conditions. In general, Waterlase is effective for gums, skin, bone – more precisely and with less bleeding than a scalpel. Tooth enamel naturally contains water. Years of BIOLASE research, the world’s leader in dental and medical lasers, led to the discovery of a water-energizing laser and the delivery of air and water in precise proportions combine to symbiotically excite water molecules from both the water spray and inside the target tissue. The result is removing teeth and gums without generating heat, vibration or pressure. Additionally, using the dental laser for gums procedure may reduce bleeding, post-operative pain, swelling and the need for pain medication in certain conditions. A waterlase dentist may often get you in and out of the dentist chair faster since it's less likely that you'll need an injection to fill your cavity in certain instances– research shows that many of patients don't. It's nice to avoid that shot, isn't it? When possible, anesthetic-free dentistry can allow your waterlase dentist to perform several procedures in a single dental appointment that used to require more than one dental visit. In certain conditions, laser dentist may perform procedures that once meant an additional trip to a periodontist for gums treatment, endodontist for a root canal or other specialist, saving you even more time. Lasers have long been the standard of care in medicine for many surgical and cosmetic procedures such as LASIK®, wrinkle and hair removal and much other dermatology, cosmetic surgery, ophthalmology uses. Dentists around the world have performed thousands of pain-free procedures with no anesthesia and no drills. The Waterlase laser lets us work on your teeth and gums with unprecedented accuracy. The heat and vibration of the dental drill can cause tiny cracks in the surrounding healthy tooth that can lead to cavities underneath fillings, the need for a root canal and even the loss of a tooth. Waterlase precisely removes the decay and minimize damaging the surrounding tooth and leaving surrounding areas relatively unaffected. This conserves and allows you to keep more of the healthy tooth structure. A "cold" cutting laser it’s safe for babies and children. Maybe especially appropriate during pregnancy, when it is best to avoid introducing any unnecessary medications into the body; for the elderly, who need to be aware of potential drug interactions; and for the immune system compromised, who should be careful to avoid cross-contamination. If you have ever had food poisoning, you know what cross contamination is. Encountering bacteria where you don’t expect it. The potential for cross-contamination between dental patients in the dental operatory is a real and widely documented risk. Waterlase laser energy kills bacteria. There is no extra cost to use our laser for a dental procedure. We offer laser dentistry because we feel it improves the quality of our dentistry in certain conditions. Often using Waterlase allows us to be more productive – avoiding the delay of waiting for the anesthetic to take effect, enabling us to do more painless procedures during one appointment, and making it possible for us to perform procedures that used to be referred out to specialists. The cost of laser therapy depends on the patient's diagnosed conditions. In certain clinical cases, it may be less expensive than traditional dental procedures because it may require fewer dental visits to the dentist and less medication to be administered. Dental insurance coverage policies typically reimburse the patient for certain dental procedures – regardless of the type of device used to perform it. So whether your dentists use traditional methods or lasers for treating you, the compensation is likely to be the same for the procedure. It is recommended to get confirmation from your insurance company first before you have the laser therapy, so you know what's covered by your insurance plan. Dental drills may cause hairline cracks and fractures in the teeth that can eventually lead to future dental problems. Waterlase laser reduces damage to healthy portions of the tooth and minimizes trauma. Waterlase laser teeth cavity preparations may increase the bond strength of white filling restoration resulting in lasting fillings. Due to its conservative, cutting action and coagulating capabilities, the Waterlase performs many gums procedures with little or no bleeding, less post-op swelling and faster healing in certain instances. The dentist may use a laser to prepare your gums around a tooth that requires a crown, or to fix a cavity or tooth fracture below the gumline, or to reshape your gums to improve the appearance of your smile. Waterlase laser energy is attracted to water, so it "seals" blood vessels, reducing or completely eliminating bleeding during these procedures. Since you often need fewer shots or anesthesia, a Waterlase dentist may perform cavity preps in all areas of the mouth in one visit. This technology also gives trained and certified Waterlase dentists the ability to painlessly perform many procedures that were previously referred to specialists in certain instances. The Waterlase is versatile. It can be used for a wide range of hard and soft dental tissue procedures - from decay removal, cavity preparation, root canals, smile design, gum and bone surgical procedures and many others. Certified all tissue laser dentist, Dr. Arocha, has received special advanced training in Waterlase Dentistry from the World Clinical Laser Institute, the world's largest dental laser education organization. For many patients with periodontal disease, scaling and root planning is not enough therapy and conventional cutting and suture surgery is too much treatment. LANAP® and DPT gums surgery provide a much-improved method for saving teeth with moderate and advanced periodontal disease for those patients who want to save their teeth but do not want or are not good candidates for conventional gums surgery. LANAP® and DPT laser procedures can now sometimes save teeth that we would have extracted in the past. For most dental patients, laser surgery provides a realistic alternative. In addition to the clinical benefits, LANAP® AND DPT therapy provide significantly less pain, recession, bleeding and teeth sensitivity, minimal to no swelling and downtime after gum treatment. We can achieve all these benefits in only one visit since the laser therapy also eliminated the painful deep scaling visit. This makes it ideal for dental patients who are fearful of conventional periodontal (gums) deep scaling and cutting surgery. If you would like to find out more about this breakthrough in treating periodontal (gums) disease to save your teeth with a laser, you can call, email us or book an appointment online. LANAP® and DPT "Deep Pocket Therapy" is a highly effective, more aesthetic and more comfortable alternative to traditional surgical procedures for patients with gums disease like periodontitis. Deep Pocket Therapy is a periodontal (gums) Laser procedure for minimally invasive removal of diseased gums tissue and tartar deposits. It changes the environment in the periodontal (gums) pocket through the removal of inflamed gums tissue and root surface calculus and tartar to promote healthy gums tissue regeneration. Unlike LANAP®, Biolase Deep Pocket Therapy DPT- has FDA clearance as a dental laser of removal of calculus and tartar to prevent and treat periodontitis. Tartar or calculus is the cause of gum disease. Deep Pocket Therapy (DPT) with New Attachment® using the Waterlase laser and Radial Firing Perio Tip® is a minimally invasive, FDA-cleared, therapy for gum disease that promotes new gums attachment to the root surface. DPT, with its patent radial tip, it also has FDA clearance to remove bacterial calculus and tartar from within the periodontal (gums) pockets. Calculus (calcified tartar) is the source for all periodontal disease. For enhanced dental clinical results, unmatched versatility, and technological superiority, the Waterlase laser is the proven treatment choice. 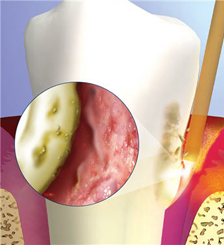 Unlike most lasers historically used in periodontal therapy that produce mostly heat the Waterlase is a cold laser, it combines laser energy and sprays of water to cut soft tissue and bone without heat, with benefits such as less swelling and patient post-op sensitivity, for a better patient experience. The Waterlase fights root canal infection. The Waterlase with Endolase removes the infection-harboring instrument smear layer remaining after rotary or hand instrumentation. This smear layer not only contains infected tissue but can seal infection within dentinal tubules. Scanning Electron Microscopy has shown how treatment with Waterlase Radial Firing Tips leaves canal walls free of smear layer, and opens dental tubules, allowing YSGG laser energy to penetrate and destroy bacteria. Laser root canal offers disinfection, minimally invasive access, greater efficacy, and promising long-term results. Dental lasers offer minimal post-operative discomfort in certain clinical cases. This means spending less money in most cases, and a more comfortable experience while in the chair. Furthermore, because our trained dentist owns a laser system, they are able to utilize the technology to perform a full range of clinical laser procedures. As of 2018, our dental office is certified on providing laser procedures on teeth, bone and gum tissue. Er, Cr: YSGG assisted new attachment procedure (cementum-mediated periodontal ligament new attachment to the root surface in the absence of long junctional epithelium).